"Mr. Emerson as a boy read Plutarch, and never tired of this early friend. When I was fourteen years old, he put Plutarch’s Lives into my hand and bade me read two pages every week-day and ten every holiday. It seemed at first an irksome task, but my mother asked me to read them aloud to her, and this made it easier. Lycurgus’s training of the Spartan boys, Archimedes’s amazing military engineering in the defence of Syracuse, Hannibal’s passage of the Alps, Scipio’s magnanimity and Cæsar’s courage and genius won their own way, as my father knew they would with a boy, and, what is by no means common with authors, the personality of the writer also, as, for instance, where he drops the narrative to hotly censure the meanness of Cato the Elder in selling his slaves when they were past service. The style of Plutarch could commend itself even to a boy." Several years ago one of my daughters and I attended a Charlotte Mason seminar. There was a group of teens and young people there, some of whom were her special friends, met online via the Advisory and AO. They had some loosely planned activities to do together, planned mainly by Advisory son Tim Laurio and his soon to be bride Hannah Hoyt (I believe they are the main planners). My girl told me a story about one of the other teens there. She knew nobody before she came, not even as online friends. She clearly felt a bit out of place and awkward- something I think most of us can sympathize with. She wasn't sure she fit in. But then one of the young people explained they were meeting at such and such a time under such and such a tree on the grounds to read Shakespeare together in character, and those who were interested could join them, but nobody was required to be there. Hold your breath a moment in preparation for what happened next. The girl feeling like a square peg in a round hole shivered and adjusted her perspective, looking, wide-eyed, her countenance brightening perceptibly as she turned to somebody near her and said eagerly, "They do Shakespeare here?" I wasn't there, so maybe I am wrong, but I always think of this story as one of those Holy Ground moments, when the kalaidescope shifts and something beautiful is revealed- and what is more beautiful than an awkward child feeling miserably alone and out of the group suddenly realizes she is not alone? Why yes, yes they did 'do Shakespeare' there, and she found her 'tribe' as she looked around at the other young people who suddenly appeared to be square pegs as well, and she realized she was in a place with plenty of square spaces in which to fit comfortably. My girl told me this young lady came right out of her shell over Shakespeare readings and seemed to have a lovely time henceforth. And I suspect that is why, when I was talking about this Conference with this daughter, now grown up, married, and with a baby, she said, "Oh, I could do Shakespeare with any interested teens who come! And so she is. The teens who wish to will be reading Midsummer Nights' Dream together in character. 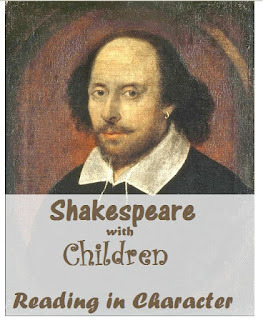 We purchased a version edited for homeschoolers by Joyce McPherson, so no worries about any of the sometimes bawdy bits Shakespeare includes. Those who want to join may, nobody is required to. Parents are still responsible for their own teens- this isn't babysitting or childcare. And because so far of those teens who are coming, most are coming to help with a younger sibling, and my girl is coming with a nursing baby, the times and locations will have to be flexible. They will work out details of where on the grounds and when amongst themselves. They will choose their parts, and read aloud in character, sharing books if necessary, breaking for the little ones amongst them as needed. It will be very flexible, very informal, and I am sure very, very delightful. Because we, too, do Shakespeare here, and so do most of you. It's still not too late to register for the conference. It is too late to ask for special dietary needs, but you may pack your own food and eat on the grounds or in your room (their rules- no outside food in their dining room). Hope you can join us! NEW GIVEAWAY!! CONSIDER THIS, by Karen Glass!! Teacher@Home, YOU WON! Please email us with your address. And to everybody else, my abject apologies for the delay in getting a name drawn. I really have no excuse except conference business putting this task right out of my head. I am ashamed. Karen will have one free copy of her book mailed to the lucky winner of our next drawing! Our drawing for her book works the same way as our previous giveaway (except I'll be using a random number generator to choose our lucky winner)- share the conference! To present your name for consideration for our give-away, please share the above link to our conference page on social media- FB, Twitter, Instagram, your blog, a homeschooling group you're in, Tumbler- whatever and wherever is out there that you are comfortable sharing our conference link. Then come back here and tell us about it in the comments, leaving a link to your share in the comments if possible. EACH time you share is one entry in a drawing. So share on twitter, tell us about it, and that's one entry. Share on FB, tell us about it, and that's another entry. I will draw the name of the winner of our giveaway when we have fifty comments, or on Friday if we get fifty entries before then. And congratulations to Amy Boesl, who won our giveaway of a mug and totebag, which we will mail right after the conference!